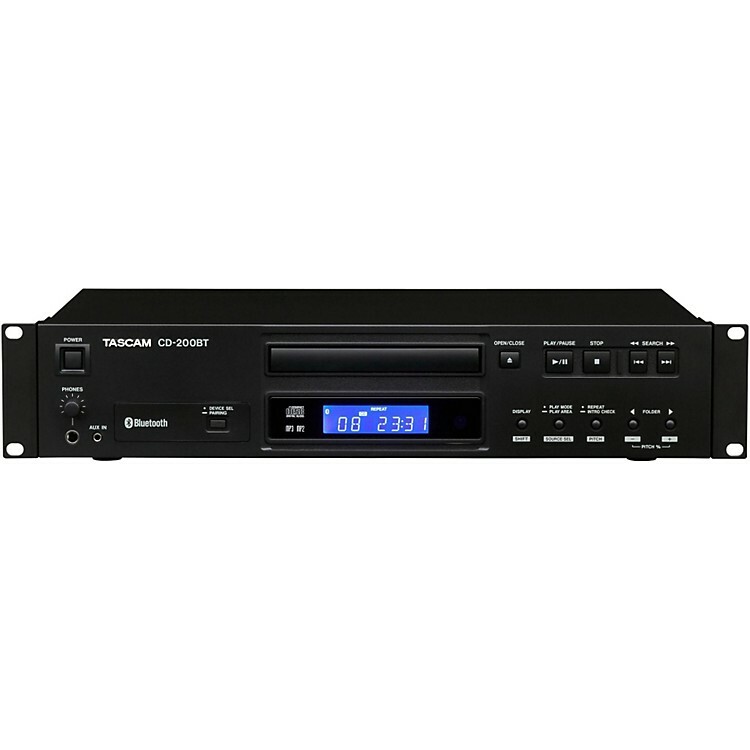 Professional rackmount CD player with Bluetooth connectivity. The CD-200BT is part of Tascam's professional line of rackmountable CD players. Each model in the series brings a unique form and function to standard CD player functionality, and the CD-200BT adds wireless BLuetooth connectivity to allow streaming of music from your smart phone, or other Bluetoooth enabled devices. Through the antenna located in the front of the CD-200BT, audio file playback signals can be received from a variety of Bluetooth compatible devices. The types of files that can be played back depend on the transmitting device; so any file type that can be played back by iTunes, Windows Media Player, smartphone player apps and other music applications can be played through this unit. Bluetooth playback uses a wireless connection, so no new wiring is necessary to use compatible audio sources as long as they are in signal-range, allowing easy and speedy playback. A variety of different profiles are used for Bluetooth transmission depending on the application. The CD-200BT supports the A2DP (Advanced Audio Distribution Profile) for high audio quality music playback, and SBC (Sub Band Codec), a standard A2DP codec. In addition, it supports the aptX codec, making high quality wireless audio playback possible. The aptX codec also has an error recovery function, so audio is much less likely to be interrupted, compared to ordinary SBC transmission. Play music reliably and easily with the CD-200BT, order today!